In addition to the league schedule being announced, last week Arsenal unveiled its new Home kit. I think we would call that a “uniform” here in the U.S. In any case, it means new shirt, new shorts, new socks, that will be worn by the team for home games. It was unveiled to much fanfare at the Emirates. Arsenal have usually worn a shirt that looks a bit like a red vest over a white short-sleeved shirt. The players would be quite nerdy looking, except the shirts are cut tight nowadays for the very fit football players. This requires the shirt makers to also produce alternate cuts appropriate for beer-drinking spectators. Let us call them “flowy.” And be thankful for both cuts. The Home kit, originally produced on Arsenal.com. I love these guys, no matter what they wear. Santi Cazorla in the center there is a particular hero in my world view. But photography is an important part of fashion and I find a few things wrong with the angle of this picture. Is the idea to maximize the size of the heads and minimize the bodies? Except for the stomachs, which here appear not so very conditioned? For a photo that has not lost the plot, see below. Also from Arsenal.com. 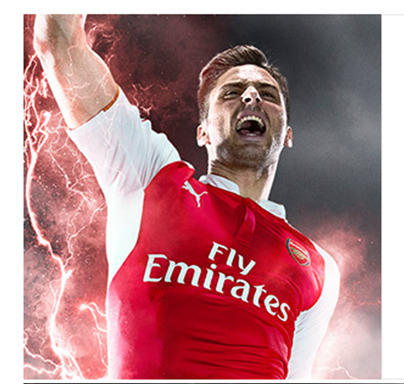 On second thought, Giroud looks a bit scary here. But good camera work capturing that real lightening! The point of the new kit every year is much the same as the point for fashion designers to produce narrow pant legs for a few years and wide pant legs for a few, short skirts for a few years, then long skirts for a time. At some point even the most fashion-adverse woman can not help but notice she is the only woman in the world not wearing skinny jeans, and so she purges her closet. In much the same way, many football fans will replace old garb with the new, if not every year, somewhat regularly. Tons of money changes hands, both because fans buy new stuff and because of cash brought in by corporate shirt sponsorship. Quite a bit of buzz is generated at a quiet time in the sport. The Away kit has not yet been announced. In my opinion, Arsenal should have to go to Anfield or someplace to unveil their Away kit. Oddly, there has been a leak of the Away kit, if you can imagine someone being compelled to leak such a thing. Naturally, the leaked away kit looks much like the home kit except it’s the bright yellow with blue sleeves that Arsenal usually wear away. Last year I got the team Home socks for Christmas which I wore secretly for games midweek under my work clothes. So to buy or not to buy new stuff? At this point I think I’ll go without items from the new kit. I’m not a fashionable woman. Does this make me less than WholeArsed? Let’s explore. Hey back! I’m enjoying your blog. Will be watching for travel tips. Sounds like a great adventure, Kyle.